Ingeniously, Friedkin’s assault on the sensibilities of the complacent, affluent freethinkers in the audience rather parallels the whammy that Pazuzu, Assyrian demon of the wind, lays on the McNeil family, which consists of Regan McNeil and her increasingly unhinged mother Chris. The Georgetown setting and Chris’s own urbane, measured atheism are hardly coincidental; Friedkin ruthlessly undermines the stately safety of educated American life — analagous, in our “modern” world, to the unquestioned safety of one’s parents’ bedroom — with an unnerving farrago of excrement, rage, vomit, blood, and libido — all from a previously delightful preteen girl. Unless Pazuzu’s wish is to irritate humanity in the maximal way possible, its gauntlet of pain and desecration seems to conform to no coherent fiend. Pazuzu sings in a wildly impressive number of registers, and the proofs of its existence, until midway through the movie, seem designed mainly to upset the audience. Regan’s Ouija board is polter-tastic; a statue of the Virgin Mary is desecrated; Regan brings the chatter of a cocktail party to a standstill by urinating on the carpet; Regan prances down the stairs, upside down on all fours, as blood dribbles from her mouth; and so on. Pazuzu’s vigor in forcing the movie’s characters to say “ick” is admirable, but the movie’s promiscuous resort to anything that will make us jump comes to seem more than a little meretricious. Friedkin’s manipulations work a lot better in the realm of form than of content; one imagines a counter-Exorcist that might have blocked the skeptics’ counters even more cleverly — and that would surely have made, admittedly, far less money. Friedkin and Blatty’s putative target may have been hifalutin WASPs, but their scurrilous strategies were deployed with lapsed Catholics in mind. To be sure, Friedkin’s psychological sense of our limits could hardly be better. Several times, the director slam-cuts away from the absolute crest of a clamorous moment to a placid long shot of the D.C. area — he always seems to know precisely what we can handle, what’s enough. 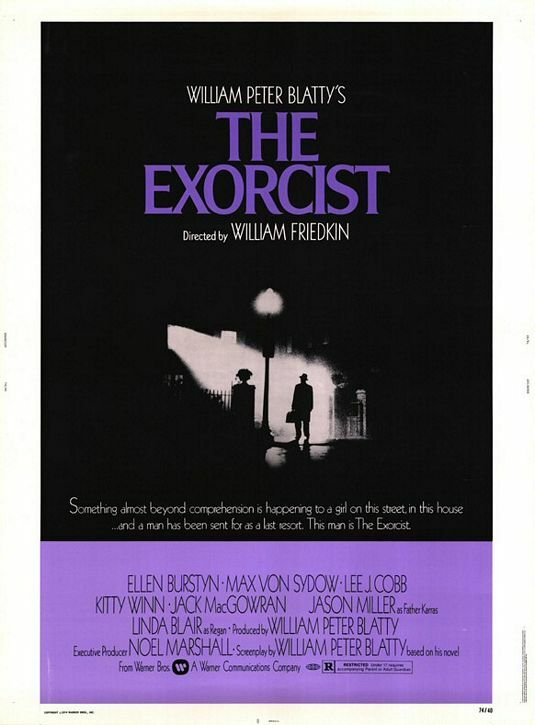 Those contrapuntal rhythms — shock, calm, shock, calm — lend The Exorcist some similarity to a musical composition. Chris, Regan, the house’s butler, a dessicated movie director, a hammy homicide cop, all those doctors, priests young, old, and in between. . . . The Exorcist is a mite overpopulated, which accords with Friedkin’s strategy of distracting us from essentials. Burstyn’s Chris is an exceptional stand-in for the audience, in that her reactions are never any less exasperated or desperate than the situation seems to require — without losing any purchase on motherly sympathy or intelligence. Jason Miller as Father Karras and Lee J. Cobb as Lieutenant Kinderman supply the much-appreciated doses of humanity that make the movie bearable. The best thing about The Exorcist is the utter absence of what, in the post-Scream world, we would all come to recognize as horror movie tropes. It’s far too cunning and original for that. The Exorcist thoroughly deserved all the money it made — but it was never anything like a true rebuttal to the secular humanists. It’s a handshake buzzer of the mind. What here smacks of 1974? The absence of conventionally sensible limits. IMDB synopsis: A visiting actress in Washington, D.C., notices dramatic and dangerous changes in the behavior and physical make-up of her 12-year-old daughter. Meanwhile, a young priest at nearby Georgetown University begins to doubt his faith while dealing with his mother’s terminal sickness. And, book-ending the story, a frail, elderly priest recognizes the necessity for a show-down with an old demonic enemy.